Looking for the Constantine news of the day? Check here. American Idol alum Constantine Maroulis has been making his mark on Broadway since appearing on the hit FOX show's fourth season in 2005. He was recently nominated for a Tony for his role in the rock musical Rock of Ages and the actor-musician credits the reality competition for the chance it gave him. "I was blessed – I was a finalist," he says. "I probably wouldn't be in this chair if I wouldn¹t have gone on the audition that day." But, he says, there is something he'd do differently if he were able to appear on Idol again. "They had a hard time getting the support from artists and publishers to clear a lot of the material, so there were a lot of songs I wanted to do that I couldn't do," he says. "Stuff from U2, Aerosmith, anything Led Zeppelin, Bon Jovi. That was the stuff I was really good at. If I could have done the 'Bohemian Rhapsody' kind of thing week after week, it would have been interesting to see how it would have worked out." 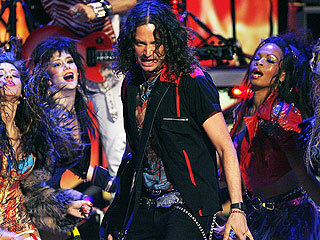 Still, Maroulis thinks his appearance helped pave the way for future rockers that appeared on the show. "I definitely opened the door for people after me, like Chris Daughtry and David Cook and all those guys," he says. "[Season 8 runner-up] Adam [Lambert]'s a good kid, I wish him all the best." Maroulis is a rocker in his current Broadway role and in real life, but he admits some of his influences come from other types of music he grew up with. Boy bands like New Kids on the Block and 'N Sync have surfaced within his Rock of Ages character. "I'm not much of a dancer, but I've tried to channel some of that for Rock of Ages for my 'Joshy J' moment," he says. The singer also appreciates the classic crooners his parents enjoyed (Frank Sinatra, Nat King Cole, Perry Como and Dean Martin among them), show tunes (he likes Brigadoon and Jesus Christ Superstar, but says his favorite is West Side Story), and is using music to reacquaint himself with his Greek roots. "We didn't listen to a lot of traditional Greek music in my house the way a lot of my Greek friends do, but I enjoy it. There's what we call Greek nights, which is basically a club night with my friends. They play a lot more of the modern music from Greece along with the traditional stuff. There's a lot bouzouki [a traditional Greek guitar] and a lot of fun," he says. "I really embrace my culture more now than I ever did." Great article, and incredible pictures!